Looking for something fun and different to do for a birthday celebration? Get a group of friends together and learn to throw axes. Prices include the ability to bring your own food, beverages and cake! We just implemented a new policy: FREE Axe Throwing on your birthday! Update (May 15, 2017): We’ve announced that anyone with a birthday will get in for free at ANY Bad Axe Throwing location. To read more details on how to get Free Axe Throwing on your birthday, check out our detailed post on the new policy. We hope everyone will appreciate it! Our experienced axe throwing coaches will teach you how to throw an axe while organizing fun games and a final tournament to crowing a champion. 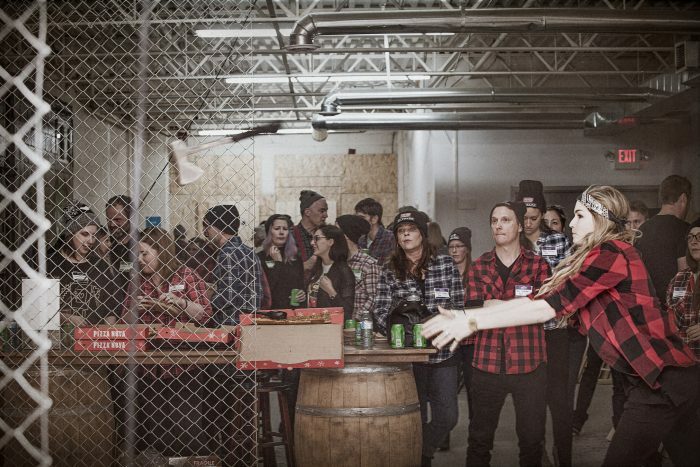 As the world’s biggest urban axe throwing club, we can host your party in 11 different cities across Canada and the U.S, including major cities such as Toronto, Ottawa, Kitchener, Surrey, Edmonton, Winnipeg and Chicago. We host various group sizes ranging from 8 to over 100 party goers! It’s a guaranteed good time for everyone! Don’t believe us? Check us out on TripAdvisor, they have ranked us as #1 in Fun and Games in Canada’s largest city, Toronto. We have an entire team dedicated to planning and coordinating birthday parties. We’ll work with you side by side to ensure all the details are met from the initial point of contact to helping you set up the streamers before your guests arrive. Our team provides consistent and fluid communication making it easy and effortless for you! We welcome patrons to bring in their own snacks, drinks and birthday cakes! Each location is equipped with tables and fridges allowing you and your guest to eat, drink and be burly while throwing axes with us! If you need help with finding local vendors, just let our team know and we’ll provide you with options. 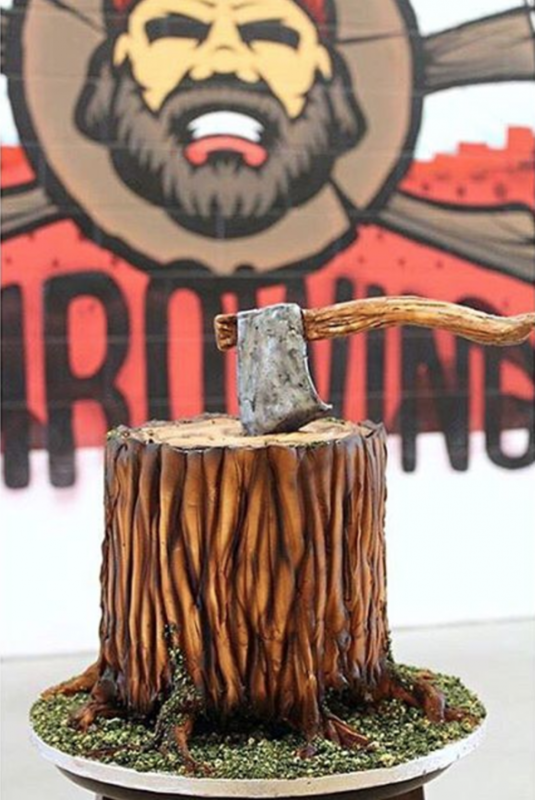 For example, in our Mississauga location, we were able to work closely with a local baker that was able to create an axe throwing themed birthday cake – a perfect addition for anyone looking to enhance the birthday experience for an adult. If you would like to request a custom cake, please let us know and we can assist with the arrangements. We’ve also got you covered for birthday gifts! Purchase a gift certificate to Bad Axe Throwing by visiting our website under Contact Us and receive the certificate via email! Birthday parties at Bad Axe Throwing are typically booked in advance through our Customer Service Team. The team is detail oriented and will ensure we capture your vision and accommodate your requests. Your group will be assigned a designated axe throwing lane, complete with tables, fridges, and score boards. Your birthday party will be spearheaded by one of our energetic axe throwing coaches. These coaches provide you and your friends with a brief orientation, coupled with lessons, and will teach you all about the point system and how tournament play works! After learning and practicing, the coaches will host fun games along with a round robin play, followed by a tournament that will crown the ultimate axe throwing champion! We’ll take care of everything from start to finish so that your goal is simply to enjoy the party and have fun! Don’t forget to bring the cake! If you’re looking to host a birthday party on the weekend, we suggest you book today as our weekend times fill up fast! Unique Bachelor and Bachelorette Parties: Forget Vegas, Throw Axes!